Ten years ago when Tim Kroeker’s last child finally graduated high school, he and his wife decided it was now or never to follow through on their dream of building a house…an alternative house…in “the country”. With their years of research they could see the advantages (and some of the downsides) to the various possible methods. So they wrote down their values and priorities, and finally decided which method and materials fit best. They decided on clay-straw. Clay-straw is an ancient technique, using abundant local building materials. Their exterior walls are 12 inches thick, enveloping a timber frame skeleton. They also used clay to make most of their floors, counter tops, and as the wall finish, inside and out. They have plenty of south facing glazing, and of course, good thermal mass in the clay walls and floors. But the building envelope is not as tight as lots of contemporary construction. There is no vapor barrier in the walls. The south facing clay straw wall mix is heavier on clay relative to the north wall. They vary according to the need to absorb sun energy on the south side or insulate against winter winds on the north. Their auxiliary heat source is a masonry heater, centrally placed. The slow release of heat radiating from the heater’s huge mass is absorbed by the floors and walls. They also have an in floor heating system, powered by a small electric boiler. They took advantage of a solar rebate program to install a grid tied, 40 panel, ground mounted photovoltaic system. After a year of operation, they are happy with the system’s performance. After 10 years in their home, they have come to the conclusion that when it comes to alternative buildings, you have to make some basic choices. For example, is your priority to reduce (or eliminate) energy consumption? 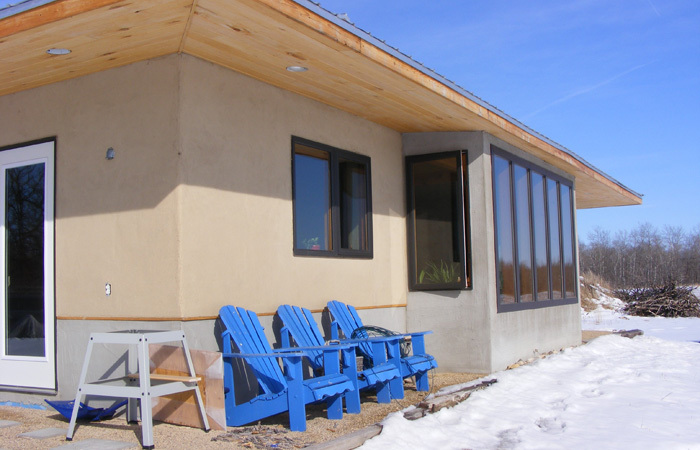 Then build a well designed, super insulated structure with the best, most expensive available windows. If, alternatively, you are more concerned about the embodied energy of your house build, and the impact on the environment of your materials over their life cycle, then move toward a more natural method…and possibly adjust your lifestyle accordingly. They were looking for a balance and feel they came close to having their home align with their values.